A normal resting heart rate is somewhere between 60 and 100 beats per minute. Many factors can influence your heart rate, including your emotions, temperature, body position, physical activity, body size, level of fitness and the food and drink you consume. Certain beverages have the ability to influence your heart rate, either slowing or raising it. For some, this may be a dangerous situation. Some coffee and teas contain a drug known as caffeine. Although most people drink coffee or tea to increase brain function and alertness, there are other effects. Caffeine is a stimulant that increases the functioning of your cardiovascular system, raising your heart rate and blood pressure. The effects of caffeine on your heart rate can be felt within 15 to 45 minutes of drinking coffee, according to the website MadSci Network. Drinking alcohol elicits a depressive effect on the body. Not only does alcohol begin to depress brain functioning, but it also depresses your cardiovascular system. 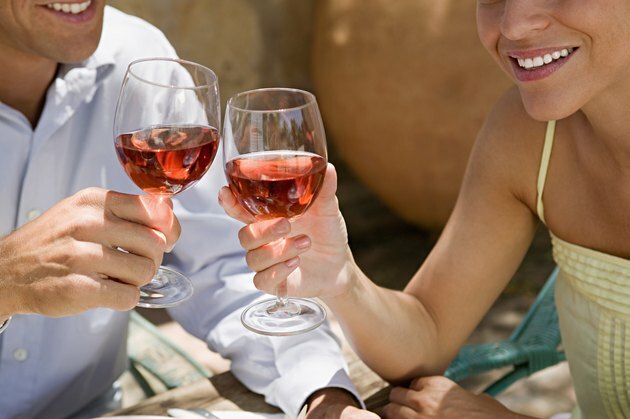 After drinking alcohol, your heart rate slows. For this reason, too much alcohol can be dangerous. Over-consumption of alcohol can slow heart rate and respiration and depress blood pressure so much that you may experience sleepiness or even a loss of consciousness. Most energy drinks work by combining two ingredients: taurine and caffeine. Taurine is an amino acid and caffeine is a stimulant drug. Both of these substances increase alertness, but also raise heart rate. A study presented at the American Heart Association's Scientific Sessions in 2007 looked at the effects of a common energy drink, containing both taurine and caffeine, on cardiovascular function. Participants consumed both substances over seven days and were monitored daily based on heart rate, ECG and blood pressure. On day one, there was, on average, an increase in heart rate by 7.8 percent; by day seven, this average increased to 11 percent. Clearly, this combination of taurine and caffeine in energy drinks raises heart rate. For some, particularly those who have known heart disease or risk factors for heart disease, an elevation or depression in heart rate may be dangerous. Be aware of what you are putting into your body by reading nutrition labels. Follow your doctor's guidance regarding the beverages that you may safely drink. What Happens If Alcohol Is Taken With Tramadol HCL? Can Certain Foods Affect Lexapro?